The Project offers young people experiencing challenges at home, school or in the community, the opportunity of extra support and regular positive adult attention. 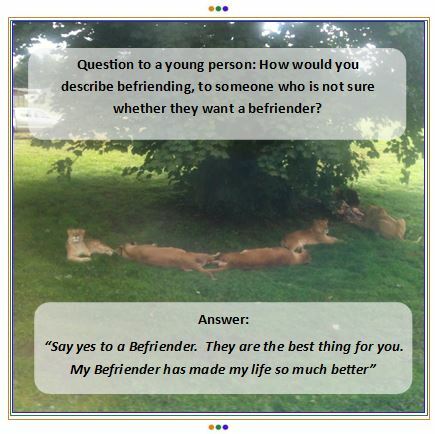 Having a befriender can help the young person tackle difficulties before they get too big, introduce them to new activities and help them be the best they can be. 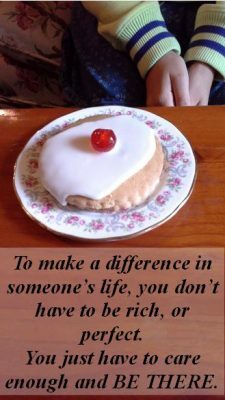 The young people benefit from the energy and enthusiasm of their befrienders and gain confidence from forming a positive relationship with a supportive adult. Coordinators in Dumfries and Wigtownshire carefully match the young person with a volunteer and support the match by arranging regular and frequent progress meetings. Who are the young people? They live in Dumfries & Galloway. They are aged 8 – 18 years old. They are referred to the Project by Social Services, Education, Health, other agencies or by a friend/relative. They may be requiring support at school, at home or in the community. They may need a break from day-to-day pressures, someone to talk to or the opportunity to undertake new experiences. 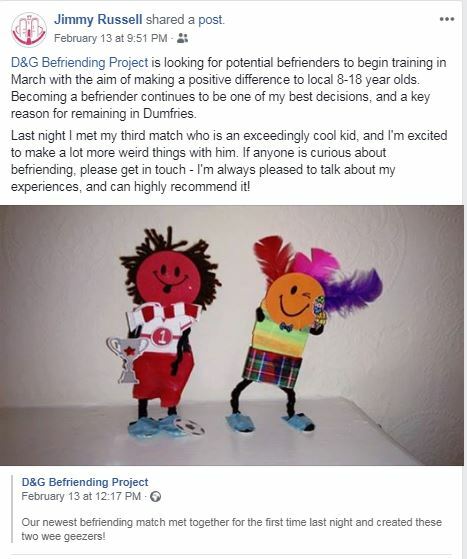 They are responsible, trustworthy, reliable, caring and friendly adults living within Dumfries & Galloway, who want to make a real difference in the community. They are people from all walks of life, and of all ages, with some time on their hands and an interest in young people. They are adults who would like to make a positive difference in someone’s life.